The New Ruler Address is Here! How does your home measure up? Here is a unique perspective on displaying your address numbers on the Ruler Address Plaque. Sized to acomodate 2 to 5 (or even more) digit address numbers on a background that is designed as the familiar tape measure or ruler. The ruler background was designed as an unusual address plaque for the woodworker or crafter. But wait, there is more! 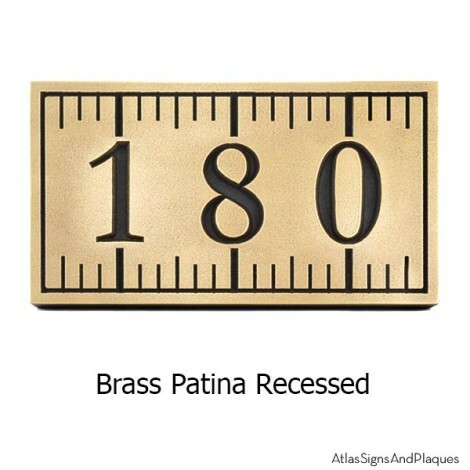 As a Ruler Wall Plaque, you can proudly display all things measured or numbered. A goal, or a goal achieved, yardage to the fence, child’s height, or years married. Imagine the possibilities. What a great gift idea! If you looking for something bigger or are interested in a matching business sign, check out The Ruler Business Sign HERE! This entry was posted in NEW - Be in the KNOW and tagged Construction, Craftsman, custom, Decor, Lumber, metal coated, personalized, Ruler, Tape Measure, Unique, Wood Worker on November 20, 2014 by AtlasSigns.